Garlic tofu stir-fry is one of those Chinese restaurant items that always amazes me at how tasty it is for being so simple. My homemade version is no exception: it’s a plateful of savory, salty, garlicky goodness. It can also be nice and spicy too, if you’re down with that, and I always am, especially during the cold days of January. The most important step in making any stir-fry is prepping everything in advance. With some recipes you can get away with chopping up veggies for part of the recipe while another part cooks. Not so when you’re dealing with stir-fries! Everything comes together super quickly, so you won’t have time for that. So chop your veggies and mix up your sauce before doing anything else. The next step is to pan-fry your tofu. The tofu needs to cook by itself, and it doesn’t actually get stir-fried. 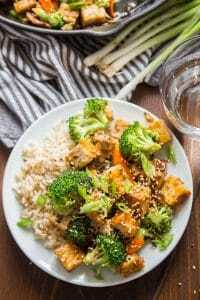 Tofu cooks differently from vegetables: it needs medium heat and a few minutes of sitting still in a hot pan in order to brown. But don’t I need a wok to stir-fry? I’m sure some purists out there will say yes, but when there’s tofu involved, I like to use flat-bottomed skillet — preferably cast iron. 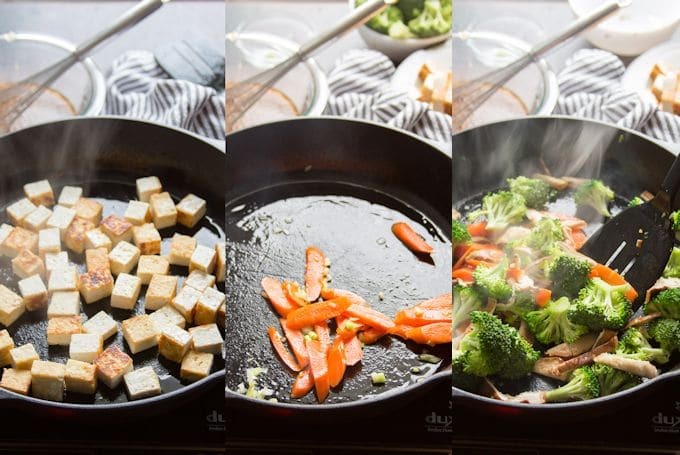 The flat surface is perfect for pan-frying tofu in a nice even layer, and while a wok might be best for heat distribution when it comes to cooking the veggies, I find a skillet does the job just fine. Feel free to use a wok if you prefer though! If you’d like some tips on how to get that crispy, Chinese restaurant-esque texture to your tofu, check out this guide. Once your tofu is golden and browned, use a spatula to remove it from the skillet. Turn up the heat, and start stir frying your veggies. Harder veggies go in first, so they get more cook time, followed by softer veggies. I started with carrots, and then added broccoli and shiitake mushrooms. Only cook the veggies until they’re tender-crisp — in other words, once they’ve begun to tenderize but still have some crunch. They’ll also have deepened in color at this point. Return the tofu to the skillet, then add the sauce. 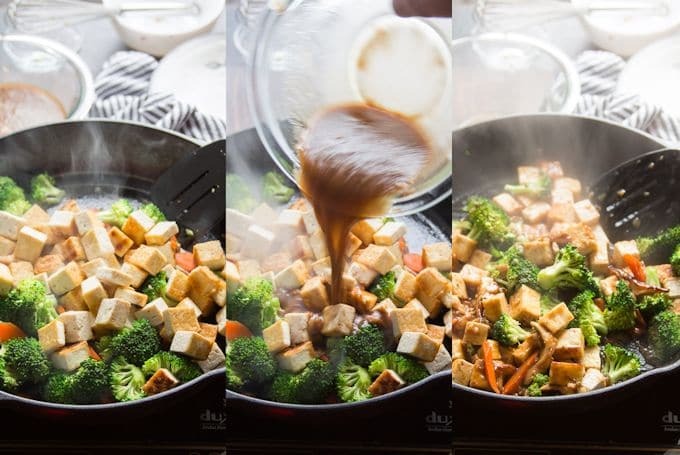 Cook everything for just a minute or two longer, until the sauce thickens up and coats the tofu and veggies. Scallions and sesame seeds go in at the end. Dish up your tofu stir-fry with some rice and dig in. 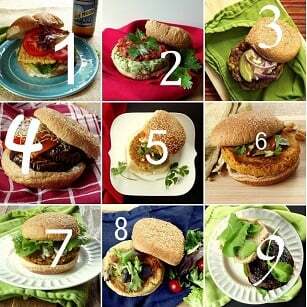 Feel free to substitute your favorite veggies. Just keep in mind the rule of thumb that veggies should be added in order of hardness, with the hardest veggies going in first, and the softest going in last. Most will require between 1 and 5 minutes of cook time. Can this be made gluten-free? Yes! Just substitute gluten-free tamari for the soy sauce. This stir-fry is best served immediately. With any stir-fry you’ll find the veggies soften up in storage. You can store the leftovers for 2 or 3 days in the refrigerator, but don’t expect the texture to be as good as it was initially. If you’d like to save time on the day of serving, I recommend doing all the prep work a day in advance. 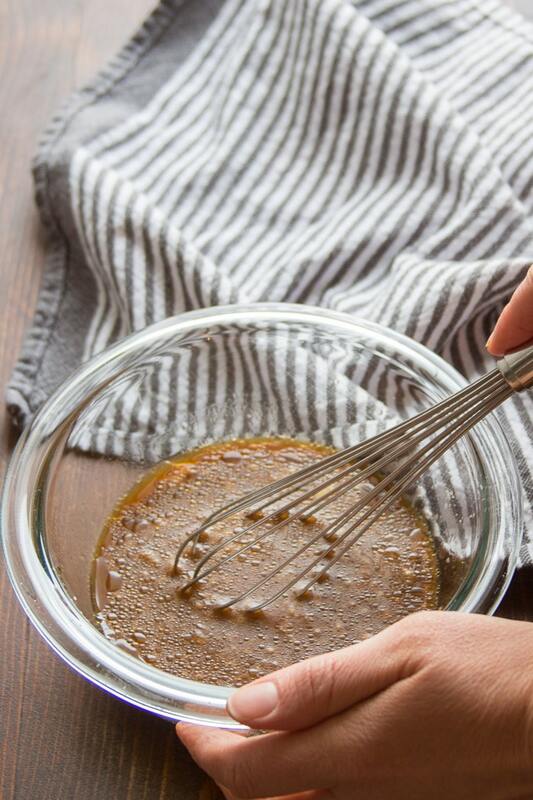 Chop your veggies, mix up the sauce, and save the actual cooking for when you’re ready. This quick and easy tofu stir-fry is the weeknight dinner you've been looking for! 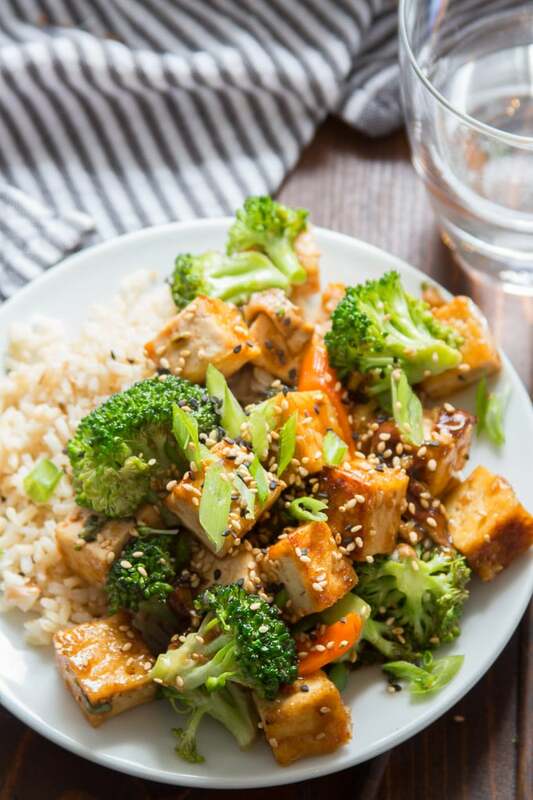 Packed with flavor, crispy tofu, and tender-crisp veggies, this dish tastes better than takeout and can be on the table in 30 minutes. Coat the bottom of a large skillet with oil and place it over medium heat. Add the tofu cubes in an even layer. 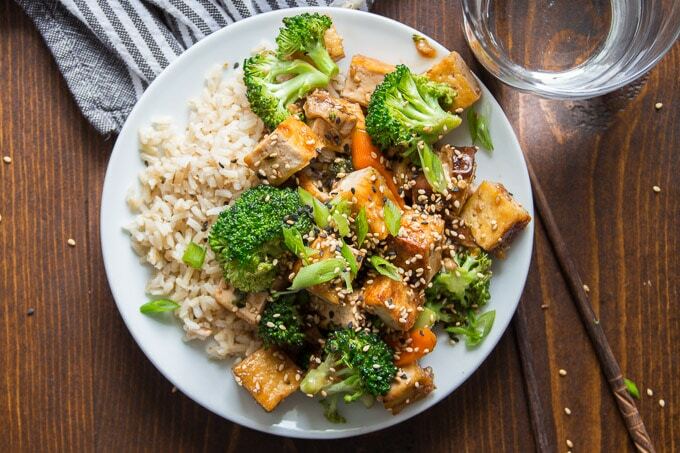 Cook the tofu for about 10 minutes, flipping once or twice, until browned on multiple sides. 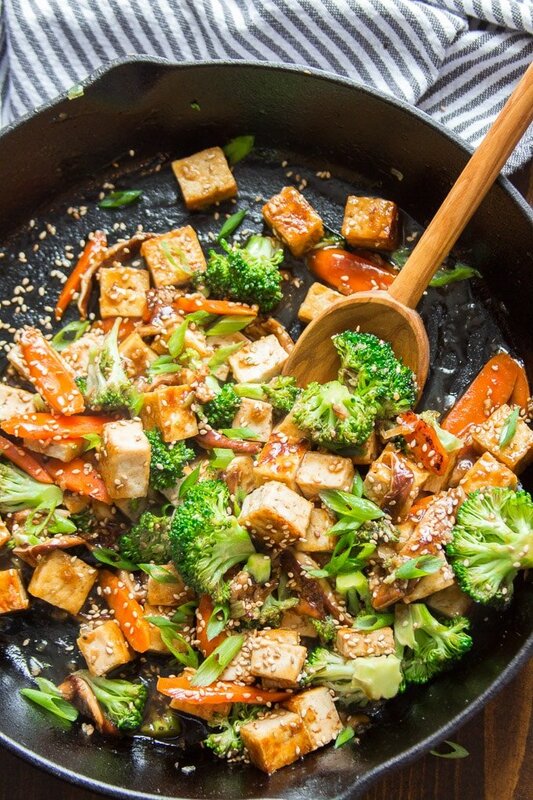 Remove the tofu from the skillet and transfer it to a plate. Raise the heat to high. Add the white parts of the scallions and carrots to the skillet. Stir-fry for 1 minute. Add the broccoli and mushrooms to the skillet. Stir-fry 2 to 3 minutes more, until the veggies deepen in color and become tender-crisp. Return the tofu to the skillet and add the sauce. Continue to cook everything for about 1 minute, stirring constantly, until the sauce thickens and coats the tofu and veggies. Remove the skillet from heat and add the green parts of the scallions. Divide onto plates and top with sesame seeds. Serve with rice. Nutrition information does not include accompaniments. I looove the look of this! 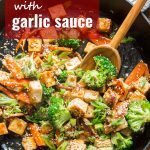 I’ve really started to enjoy tofu lately, and I love cooking up a quick stir fry with a tasty homemade sauce :) This one sounds yummy! Did you dessicate the tofu first or just take it straight from the container with water? Which type of tofu did you get? My husband and I made this for dinner tonight and really enjoyed it. The sauce is delicious: a little sweet, a little smoky, a little spicy. The sauce is also easy to whisk up, and really elevates a simple stir-fry. I made this recipe as written, but added thin strips of baby bok choy just because I wanted to use it up. I added the bok choy at the end of cooking, just before adding the sauce, and that worked fine. I’ll definitely make this again. Thanks! I love bok choy in stir-fries – I’ll bet it was excellent in this! I’m so glad you enjoyed it! Thanks Colleen!! I made this and amped up the veggies, adding a small chopped up cabbage and a bag of broccoli slaw that had snow peas and shredded carrots. Added scallions too. I cook low sodium so I used a low sodium vegan soy sauce I made from other recipe…it came out delish! I’d share a picture if allowed. This was my first time using avacodo oil with the tofu, yay it didn’t stick to the pan how wonderful. Great recipe! I made this for the first time tonight, and my husband said, “This is outstanding!” My18-year-old son and I loved it too. I doubled the recipe, and ended up with some leftovers for lunch tomorrow. It was excellent with brown basmati rice and your smoky tofu dumplings. Never had a bad meal using one of your recipes. Thank you! That’s so great to hear! I’m glad it was a hit with you and your family. Thanks so much Melanie!! I’ve made this twice now and I love it. It’s super simple and tastes so great. I used the link you provided to prepare my tofu and it came out perfect. Thank you. This is now a recipe I will make frequently and I’ve shared it too. I’m so happy to hear that! Thanks so much Kathy!